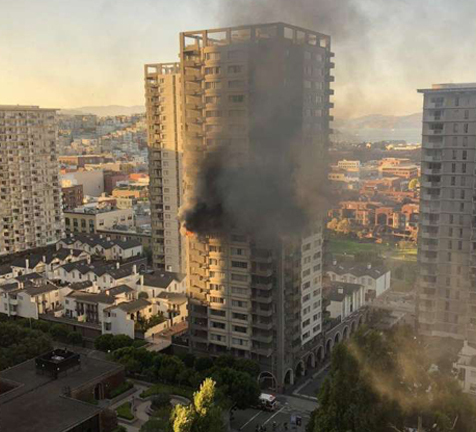 As commuters headed home from work, black smoke billowed above the San Francisco's Financial District from a three-alarm fire at the 196-unit apartment building located at 405 Davis Court. Officials said the blaze, which spread up through five floors in the midsection of the 25-story high-rise, started around 5:30 p.m. on Monday and lasted about 40 minutes. The building is part of the Gateway apartment complex. Floors 12 through 16 were affected as the fire raged throughout 10 apartment units and the hallways. The Fire Department reported no injuries, as residents were evacuated safely or sheltered in place. The fire alarm rang as it should have, and officials are still seeking out the cause of the flame. As we all hear stories about how Mass Timber CLT high rise buildings are coming to cities all around the USA, we have to fear a fire like this in a tall raw wood structure. We understand why building with mass timber is good, because lumber is renewable and more sustainable than steel. However, since CLT has no fire history to support the E119 fire science,we must do more and make CLT Class A fire protected to lower the risk perception and make these buildings safer and better. M-Fire is going to burn two 2 story Mass Timber buildings side by side in a fire training center to see the difference in loss when one building is made from raw wood and the other is Class A Fire treated wood. We will keep you posted on the results of this demo via film. Copyrights 2018 @ M Fire Suppression Inc.